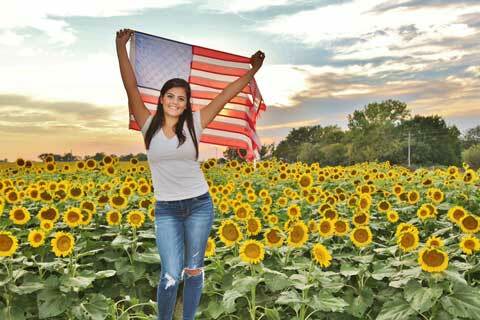 Chenoa Casebier’s photo of a girl holding a flag in front of sunflowers was the first place winner in the Lyndon Leader 4-H Club’s recent sunflower photo contest. The Lyndon Leader 4-H Club’s recent community sunflower project proved to be popular, attracting many people from Osage County and beyond to a sunflower field north of Lyndon. 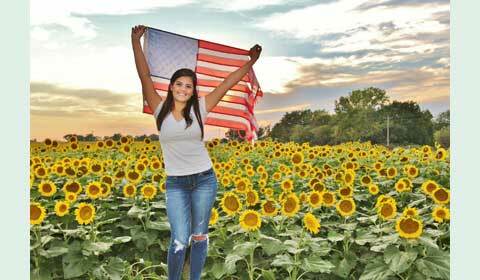 Showing their rural hospitality, the 4-H club had invited everyone to view the field along U.S. Highway 75, stop to take photos for a photo contest, walk among the sunflowers and pick some if they wished. Winners of the photo contest have been announced: First-place winner was Chenoa Casebier, of Osage City, with a photo of a girl holding a flag in front of sunflowers at sunset; second-place winner was Chelsi Simpson, Chelsi Simpson Photography, Osage City, with a portrait of two children sitting on a hay bale in the sunflower field. Photo entries were displayed on the club’s Facebook page, and winners were determined by the most likes, comments or shares from Aug. 22 to Sept. 10. For more information, see “Lyndon Leader Sunflowers” on Facebook. See related story here. See second-place winning photo here.